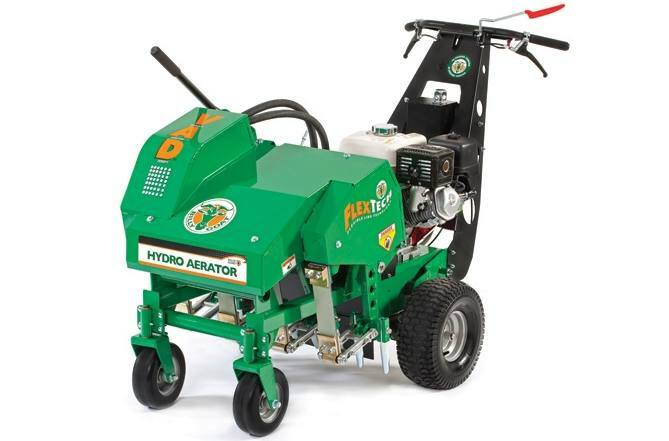 This machine combines true 30" wide aeration and speed up to 4.3 mph to complete 1/4 acre in as little as 15 minutes! That's 59% faster than a 26" drum! Plus no more lifting on turns; aerate in reverse; do trim and edges with ease; and significantly improve hole quantity and quality vs. drum aerators. The AE1300H features Patent Pending variable aeration density (VAD™) and creates 2-10 times more holes than drum models in one pass (8-48 holes per sq. ft.) This eliminates double or triple aerating with drum aerators that have fixed hole patterns as low as 4 per sq. ft. and saves significant time. VAD also offers ability to do patch repair and seed bed prep in one pass by simply slowing down over bare spots. Reverse Aeration: The AE1300H allows aeration in reverse! Variable Aeration Density (VAD™): Creates 2-10x more holes than drum models in one pass. Eliminates double aerating and offers ability to do patch repair and seed bed prep in one pass. Patent Pending. 15" Tires & 35" Wheel Base: This unit has 15" tires and a 35" wheel base to accommodate slopes up to 20-degrees. In-Ground Turning: Provides unmatched maneuverability, ergonomics, ease of turning, improved production, reduced downtime and turf repair when compared to drum aerators. FLEXTECH™ Arms: Independently acting arms are durable and forgiving for unmatched reliability. Reciprocating action drives plug depths up to 2x that of drums. Reduces call backs and / or rework regardless of soil condition. Patent Pending. Self-Propelled, Variable Speed: Intuitive hydro-drive controls allow you to feather the speed and aerate in both forward and reverse with finger tip control. Reduces fatigue and vibration.